I have to confess that when I started working here at The Canadian Canoe Museum I didn’t know what a wanigan was. For the small percentage of hard-core canoe trippers (and the large percentage of everyone else!) 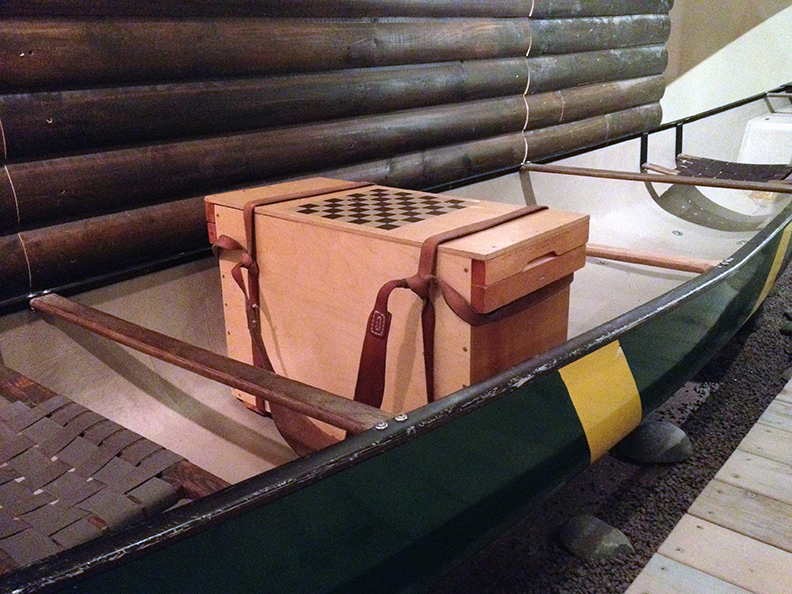 who don’t know what a wanigan is – it’s a wooden box, carried with a tumpline, and usually used to store kitchen supplies while on a canoe trip. When I had the opportunity to make one for myself, as part of the preparation for a program we were doing here at the Museum, I jumped at the chance. I went on a trip not long after I finished my wanigan and I have to say that I loved it. I also have to say that it did take a bit of getting used to. At first I hadn’t tied the tump correctly for my height and it was resting lower on my back than it should have been, which meant it was bouncing a bit which was very uncomfortable. Once I adjusted the tumpline it was perfect, and I truly felt like a super-hero carrying much more weight that I ever could have comfortably done with a backpack. There is some interesting research showing the efficiency of carrying weight on your head. 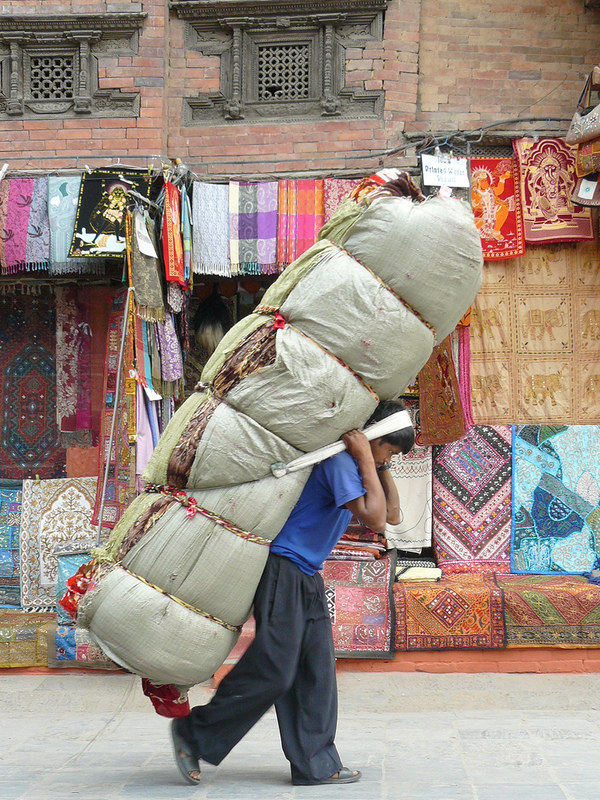 Studies have found that people can carry 20% of their body weight, with no increase in physical exertion when the weight is on their head – making it a very efficient way to carry a load. During World War I Canadian soldiers used tumplines to carry loads and were recognized for being able to carry large loads, long distances in a short time (you can see a great video here, the portion with soldiers using tumplines starts at minute 4:40). Even further back in time Voyageurs would carry two 90lb packs on a portage (that’s 80kg! ), and they did it using tumplines too. The use of tumplines was very common among First Nations people in North America, and also in South America and an artistic rendition of a person carrying a load with tumpline has been found in Peru and dated from 1000 AD. I know a lot of people would choose a barrel pack over a wanigan and I don’t think there’s anything wrong with that. However, if you’re the kind of person who likes cast iron pans, not non-stick; or the kind of person who still has a rotary phone in their house because it’s so old that it’s cool now; or the kind of person who brings a grill on a canoe trip and not a gas stove – then tripping with a wanigan might just be for you. BUT, it’s not only cool for the being a bit retro, it’s also very practical. You can organize all your camp-cooking stuff in one place, use the lid as a cutting board, it doubles as a seat in camp (for two if you snuggle up! ), and if you paint a game board on the lid it becomes a fun rainy day activity. I will say that it’s important to make sure your tumpline is tied for optimal wanigan-carrying comfort. It’s not a bad idea to put an even, but fairly light load in your wanigan, tie the tump and carry it around your yard, or up your street to see how it feels, then adjust your tumpline accordingly – especially if you’ve never carried something with a tumpline before. Another tip is if you are going to be the person carrying the wanigan make sure you are the person who is packing the wanigan. If you’re interested in giving a wanigan a try we have an amazing Wanigan and Tumpline Workshop coming up where you build your wanigan and sew your leather tumpline all in one day here at the Museum. Great article. How about a follow up about using a tump for carrying a canoe? Yes! That would be an excellent follow up! I think our Curator, Jeremy Ward, would be more qualified than I am to write that one, but it’s a great idea! “Even further back in time Voyageurs would carry two 90lb packs on a portage (that’s 80kg! )” This chestnut is often repeated. Actually, back when the average voyageur was 5’2″ and 125lbs, a “livre” was not the same measure. That’s good to know Rob, thanks for the correction. How much weight were they carrying then? « Family Day is Art Day at the Canadian Canoe Museum!